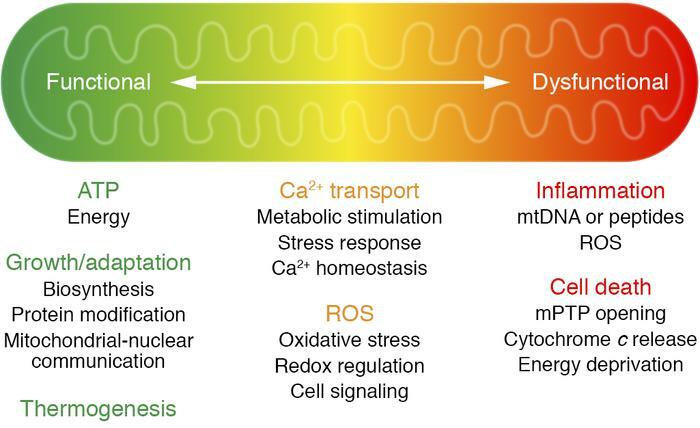 An overview of mitochondrial function in health and disease. Mitochondria are known as the powerhouse of the cell. Under normal conditions, oxidative metabolism in mitochondria produces ATP; it also produces heat in certain specialized cell types, such as brown adipocytes. In addition to generating ATP, intermediate metabolism in the mitochondria produces metabolites for biosynthesis, protein modification, and signal transduction. Oxidative phosphorylation is coupled with generation of reactive oxygen species (ROS), which can either serve as molecular signals or cause cell damage and cell death. Mitochondrial metabolism is stimulated by calcium, but under pathological conditions, calcium overload can trigger the opening of the mitochondrial permeability transition pore (mPTP). The release of mitochondrial content, such as cytochrome c, induces apoptosis, or the loss of membrane potential (a consequence of prolonged mPTP opening) causes ATP deprivation and necrosis. Leak of damage-associated molecular patterns (DAMPs), such as mitochondrial DNA and peptides, or excessive ROS generation also causes inflammation that results in further tissue damage. The transition of mitochondria from a powerhouse to a death engine is key to the pathogenesis of many diseases, including heart failure (also see Figure 3).